This chart shows Bride price / Dowry by Country. Bride price, best called bridewealth,also known as bride token, is money, property, or other form of wealth paid by a groom or his family to the parents of the woman he has just married or is just about to marry. Bride price can be compared to dowry, which is paid to the groom, or used by the bride to help establish the new household and dower, which is property settled on the bride herself by the groom at the time of marriage. The bride price agreed may or may not be intended to reflect the perceived value of the bride.Some cultures may practice both dowry and bride price simultaneously. Many cultures practiced bride pricing prior to existing. A dowry is a transfer of parental property at the marriage of a daughter.Dowry contrasts with the related concepts of bride price and dower. While bride price or bride service is a payment by the groom or his family to the bride's parents, dowry is the wealth transferred from the bride's family to the groom or his family, ostensibly for the bride. Brideprice / Wedding Costs by Country, Woman Stats Project, viewed 6th April, 2016, <http://www.womanstats.org/substatics/Brideprice_Dowry_Wedding_Costs_2correctstatic.png>. 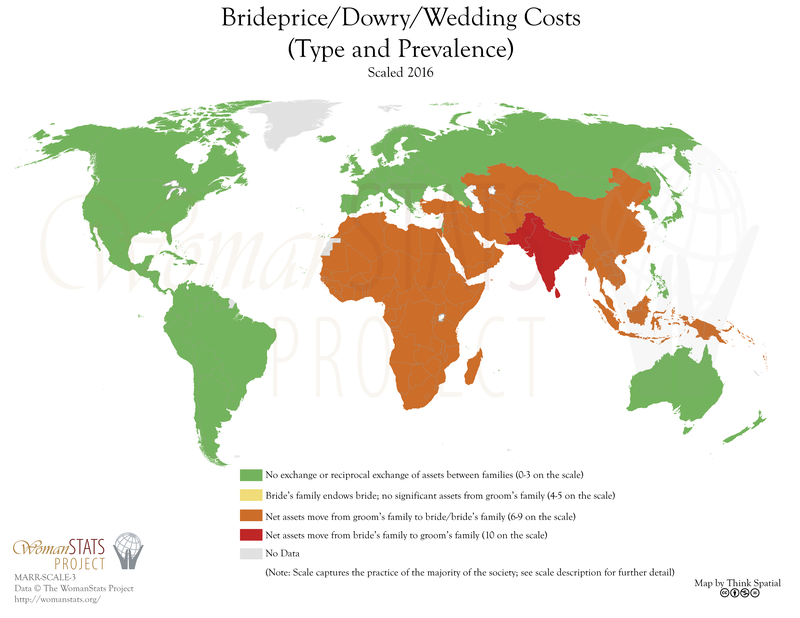 Brideprice / Dowry by Country, ChartsBin.com, viewed 26th April, 2019, <http://chartsbin.com/view/40102>.